AUGUSTA, Ga. – As we age, it just may be the ability to filter and eliminate old information – rather than take in the new stuff – that makes it harder to learn, scientists report. “When you are young, your brain is able to strengthen certain connections and weaken certain connections to make new memories,” said Dr. Joe Z. Tsien, neuroscientist at the Medical College of Georgia at Georgia Regents University and Co-Director of the GRU Brain & Behavior Discovery Institute. It’s that critical weakening that appears hampered in the older brain, according to a study in the journal Scientific Reports. The NMDA receptor in the brain’s hippocampus is like a switch for regulating learning and memory, working through subunits called NR2A and NR2B. NR2B is expressed in higher percentages in children, enabling neurons to talk a fraction of a second longer; make stronger bonds, called synapses; and optimize learning and memory. This formation of strong bonds is called long-term potentiation. The ratio shifts after puberty, so there is more NR2A and slightly reduced communication time between neurons. When Tsien and his colleagues genetically modified mice that mimic the adult ratio – more NR2A, less NR2B – they were surprised to find the rodents were still good at making strong connections and short-term memories but had an impaired ability to weaken existing connections, called long-term depression, and to make new long-term memories as a result. It’s called information sculpting and adult ratios of NMDA receptor subunits don’t appear to be very good at it. “If you only make synapses stronger and never get rid of the noise or less useful information then it’s a problem,” said Tsien, the study’s corresponding author. While each neuron averages 3,000 synapses, the relentless onslaught of information and experiences necessitates some selective whittling. Insufficient sculpting, at least in their mouse, meant a reduced ability to remember things short-term – like the ticket number at a fast-food restaurant – and long-term – like remembering a favorite menu item at that restaurant. Both are impacted in Alzheimer’s and age-related dementia. Acknowledging the leap, this impaired ability could also help explain why adults can’t learn a new language without their old accent and why older people tend to be more stuck in their ways, the memory researcher said. “We know we lose the ability to perfectly speak a foreign language if we learn than language after the onset of sexual maturity. I can learn English but my Chinese accent is very difficult to get rid of. The question is why,” Tsien said. Tsien and his colleagues already have learned what happens when NR2B is overexpressed. He and East China Normal University researchers announced in 2009 the development of Hobbie-J, a smarter than average rat. A decade earlier, Tsien reported in the journal Nature the development of a smart mouse dubbed Doogie using the same techniques to over-express the NR2B gene in the hippocampus. Doogie, Hobbie-J and their descendants have maintained superior memory as they age. Now Tsien is interested in following the NR2A over-expressing mouse to see what happens. 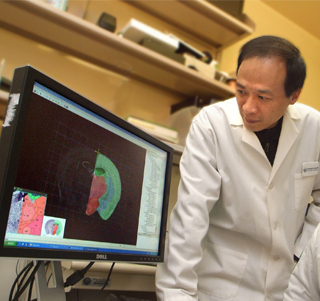 Tsien is the Georgia Research Alliance Eminent Scholar in Cognitive and Systems Neurobiology. The research was funded by the National Institutes of Health and the GRA.